(by Steve Birr, The Daily Caller) – A police officer in West Virginia was rushed to the hospital Saturday after being exposed to the deadly synthetic opioid fentanyl during a roadside drug bust. 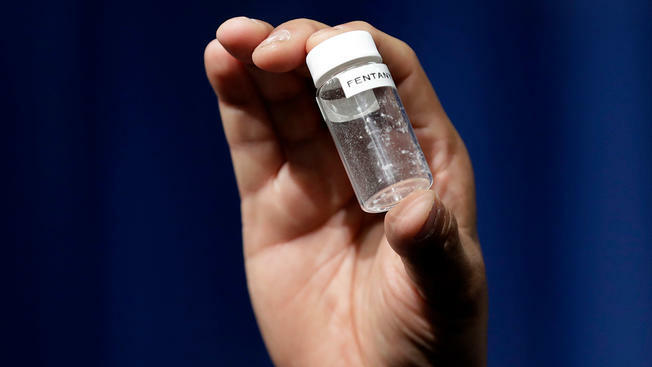 Rich Gilkey, chief of the Mason City Police Department in West Virginia, was conducting a vehicle search along with a patrolman on April 14 when he came in contact with cotton balls soaked in suspected fentanyl. Gilkey and Officer Kendall Roush had pulled over a Ford Ranger for erratic driving and the driver became agitated after the pair asked to search the car, reported the Gallipolis Daily Tribune. After restraining the driver, 30-year-old Nathan Keffer, Gilkey searched the vehicle and found heroin, suboxone, a hypodermic needle and the cotton balls soaked in fentanyl. Gilkey became lightheaded and dizzy after coming into contact with the cotton balls, and said the quick action of West Virginia State Trooper G.C. Burnem likely saved his life. Gilkey was rushed to Pleasant Valley Hospital, where he tested positive for fentanyl. He rested there overnight to recover from the incident. 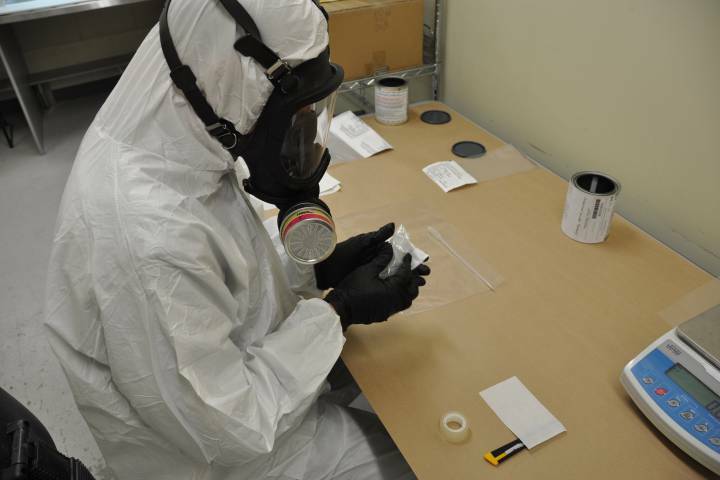 Canadian police process packages of fentanyl. Law enforcement continues to grapple with the added risk of exposure to synthetic opioids during drug encounters, which are causing first responders to overdose throughout the country. Body camera footage from police in Columbus, Ohio, recently emerged showing an officer being revived with the overdose reversal drug Narcan at the scene of a drug bust after suspected fentanyl exposure. The footage shows an officer with the Columbus Division of Police suffering a drug overdose in his vehicle. His partner is seen questioning a woman in cuffs in the back of a police cruiser about what substance she had in her car, which she said did not contain any fentanyl to her knowledge. “Okay, well we have an officer having an effect right now,” the officer responded. The woman then told the officer that her dealer claimed it was a combination of meth and ice. After injecting the officer with a dose of the opioid overdose reversal drug Narcan in both nostrils, police helped him out of his cruiser to rest on the ground as he recovered. The Ohio Department of Health recently asked medical professionals and first responders to start using the opioid overdose reversal drug Narcan for any situation where a person has overdosed on drugs in case fentanyl is involved. Opioids are killing a record number of people in Ohio, which now has the second highest death rate from drug overdoses in the U.S. behind only West Virginia. Drug overdoses are now the leading cause of accidental death for Americans under age 50, according to the Centers for Disease Control and Prevention, claiming more than 64,000 lives in 2016. Reprinted here for educational purposes only. May not be reproduced on other websites without permission from The Daily Caller. 2. How did Chief Gilkey come in contact with fentanyl? Be specific. 3. What challenge do law enforcement agencies across the country face in dealing with the spread of fentanyl? 4. In which instances has the Ohio Department of Health recently asked medical professionals and first responders to start using the opioid overdose reversal drug Narcan? 5. a) Which two states have the highest death rate from drug overdoses in the U.S.? b) How many people died from drug overdoses across the country in 2016? 6. Watch the video from the Colombus, Ohio police officer’s body cam following another officer coming in contact with fentanyl after a drug arrest. Do you think you would view the seriousness of the fentanyl crisis differently if your parent or other relative was a police officer who had to face the possibility of this added danger with every drug arrest? Explain your answer.